Exposure of glassy Snake River Plain-type rhyolite near Goose Creek, Box Elder County. Photograph by Donald Clark. 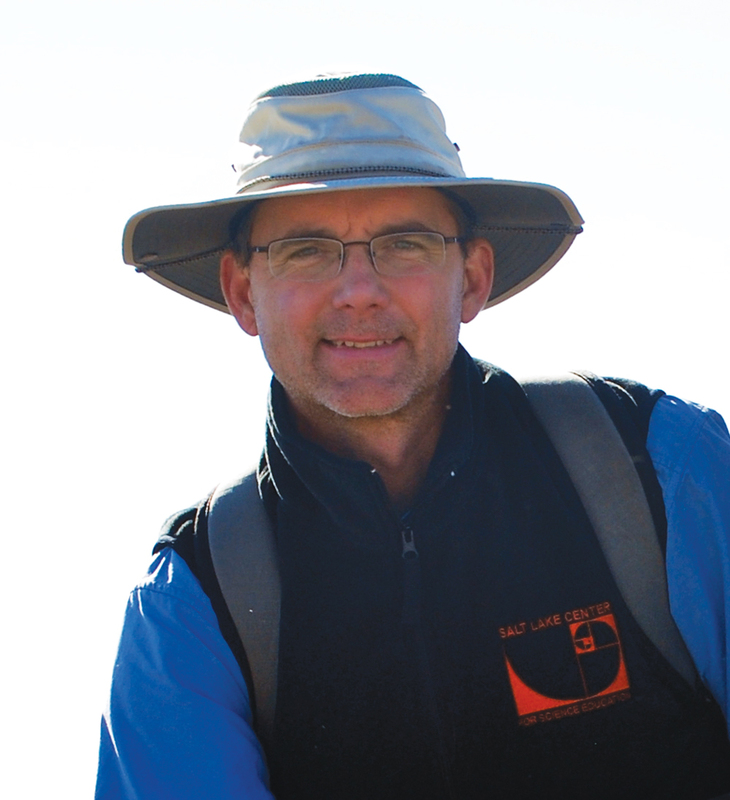 Grant Willis has been a mapping geologist with the UGS for 28 years, including 17 years as manager of the Geologic Mapping Program. 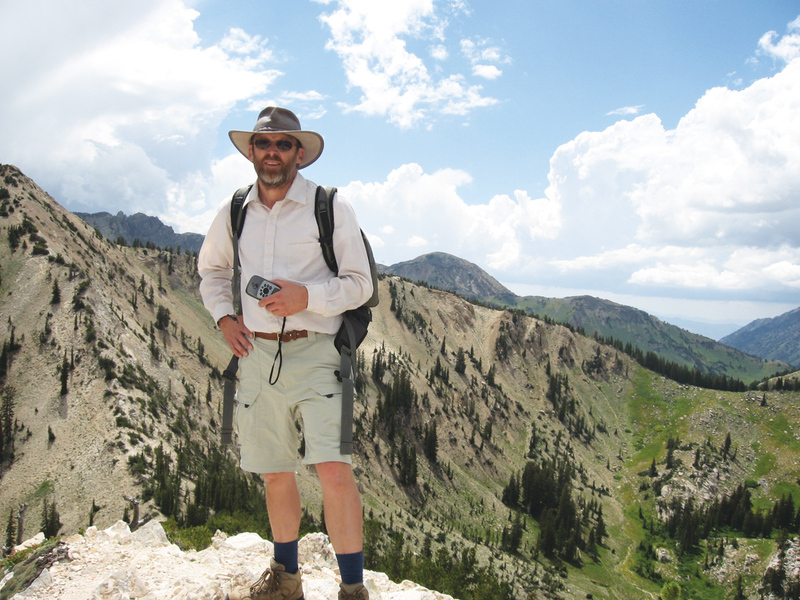 He has authored or coauthored over 40 geologic maps, and is currently mapping Glen Canyon National Recreation Area. Donald Clark has been a mapping geologist with the UGS for eight years, and previously was a UGS contract and student mapper. He has authored or coauthored 12 geologic maps in northwest and central Utah, and is currently working on the Rush Valley and Grouse Creek 30′ x 60′ quadrangle maps. Few people visit there, fewer people live there, and other than a dry strip along I-84, few people have even seen most of northwest Utah, yet this area may prove to be an important player in Utah’s energy future. The roughly 7000-square-mile area that extends from the Wasatch Front, across Great Salt Lake to the Nevada and Idaho border, is remote and desolate, but it holds a rugged beauty of its own. It hosts some of Utah’s most complex, poorly exposed, and least understood geology; however, a few intriguing clues suggest that vast geothermal resources may lie beneath these desert basins. This potential, coupled with largely unknown potential for fresh water, a rapidly growing building-stone and flagstone trade, a scarcity of accurate geologic maps, and a lack of knowledge about earthquakes and others hazards, induced UGS geologists to team up with USGS and university colleagues to improve surface maps and subsurface knowledge of the four 30′ x 60′ quadrangles that cover this huge area. Over the past few years, the drive to develop alternative (non-hydrocarbon) energy resources has focused much attention on Utah. Deep-seated faults, abundant warm and hot springs,high temperatures encountered in some drill holes, three operating geothermal power plants, and much success passively heating greenhouses and buildings all hint at large untapped geothermal resources beneath parts of western Utah. The northwest part of the state may have significant potential. It has very young volcanic rocks (some less than 500,000 years old), and the Indian Cove well in Great Salt Lake encountered temperatures of 430° Fahrenheit at 12,400 feet depth. This high temperature—about as hot as the highest setting on your kitchen oven—makes it very attractive for traditional-style geothermal power plants. But this is only one good data point in a vast area. If we want to accurately assess the resource, we need a better understanding of which sedimentary basins have the best potential for high temperatures, and which host rocks have the best permeability and porosity. Exploration efforts are handicapped by the lack of detailed geologic maps and limited subsurface data. Before spending millions of dolars to drill exploratory holes, we first need to complete better geologic maps of the faults and rock exposures around the basins, and to collect less expensive geophysical data to get a better handle on the depth, shape, and rock composition of the basins. Over the past four years we have ramped up geologic mapping and geophysical data acquisition in the area. The northwest part of the state has long stood out as an area in need of better geologic maps. It has some of the most complicated geology of any similar-size area in Utah. Key geologic and logistical challenges include: (1) it is cored by a large metamorphic complex and as a result has the most highly deformed and altered strata of any part of the state (see sidebar), (2) due to generally poor exposures, formations in the region are not well defined, making the highly deformed sections even more difficult to decipher, (3) much of the area is masked by Lake Bonneville deposits, (4) structural basins are abundant, but they are not demarcated by the well-defined normal faults that bound most basins in the Basin and Range Province, (5) very little geophysical data and very few drill holes limit subsurface control, and (6) rugged terrain, few roads, and large tracts of military and private land make mapping and data acquisition slow and expensive. This is not the type of area that a new geologist can drop into “cold turkey” and expect to immediately start mapping. We need specialists who have devoted many years, even decades, to working out the complicated geologic puzzle. Three years ago the “stars were aligned!” Through the late 1970s to mid 1990s, USGS geologist David Miller was busy mapping 7.5′ quadrangles in western Utah preparatory to completing four 30′ x 60′ quadrangles. But his plans were waylaid in 1994 by budget cuts. We were able to publish several of his 7.5′ quadrangle maps in the UGS map series. But several other unfinished maps, including three partially completed 30′ x 60′ maps, were relegated to file cabinets. We recognized that his accumulated knowledge was more valuable than the lines on paper, and for over a decade we lobbied the USGS to fund Dave to finish the job. Finally, in 2006 the USGS was able to dovetail this “high desert” project into his other work. Dave was only given enough time to work on the Newfoundland Mountains and Tremonton 30′ x 60′ quadrangles, the two with the most completed mapping, but he was determined to finish the work. After seeing Dave’s early results, the USGS agreed to extend the project if the UGS could contribute a significant portion of the effort. 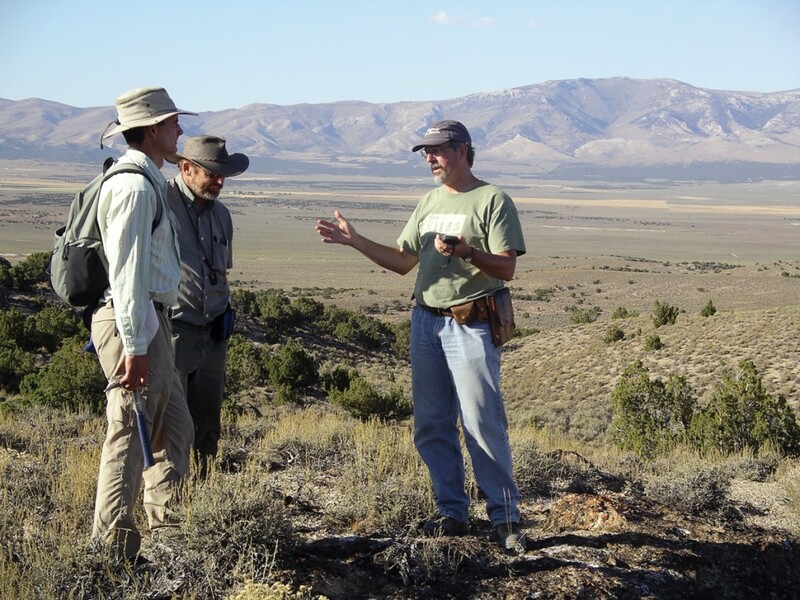 The Utah State Geologic Mapping Advisory Committee recognized this unique opportunity and helped us secure National Cooperative Geologic Mapping Program federal/state cost-share funding. We added Mike Wells (structural geologist at University of Nevada, Las Vegas), who did his dissertation followed by 20 years of guiding student projects on the Albion (Idaho)/Raft River/Grouse Creek metamorphic core complex; Jack Oviatt (geomorphologist at Kansas State University), who is the leading expert on Lake Bonneville deposits; Mike Perkins (University of Utah), who spent his career studying volcanic ashes (tephras) from eruptions in the Yellowstone hotspot that blanketed the area in the late Tertiary; and Donald Clark (UGS), who has established himself as our lead mapper of northwest Utah geology. Dave added Tracey Felger, an experienced USGS mapper, and Vicki Langenheim, a USGS geophysicist. We are now well into the third year of this four-year project. This team has been able to combine many older maps with extensive new mapping to accurately depict the complicated geology of the area. We will be ready to release the first open-file version of the Grouse Creek map in less than a year. In time, this new mapping and research may pave the way for development of a large, environmentally clean, renewable energy resource in Utah. While the Basin and Range Province from central Idaho to southern Nevada is characterized in part by deep valleys, northwest Utah stands out for having unusually broad basins with irregular, poorly defined margins. In addition, complex intervening bedrock ranges, broad salt and mud flats, large military bombing ranges, and limited surface evidence of petroleum potential have resulted in few exploration drill holes or seismic lines in the area. 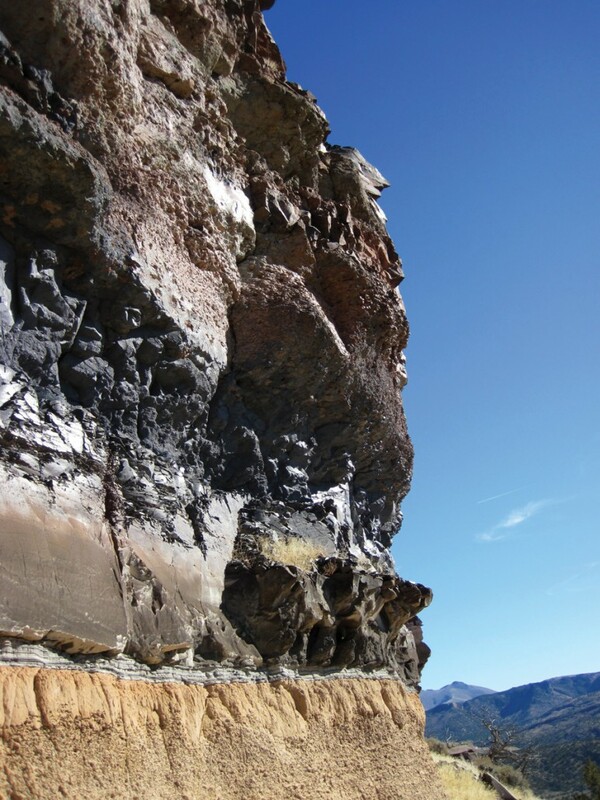 The one exception, thick tar-like oil seeps at Rozel Point in Great Salt Lake near Promontory Point, generated some drilling and seismic studies in the 1980s. The heavy, low-grade oil, logistical problems, and unknown size of the oil reservoir doomed the enterprise, but this project did give us a glimpse of the subsurface geology on the east side of the area. And one drill hole, the Indian Cove, yielded high subsurface temperatures that triggered the recent interest in geothermal resources. Additional drill holes are badly needed, but drilling is expensive. Before spending millions of dollars on a drilling program, we need better understanding of the shape, composition, and depth of the basins. For that need, we turn to geophysics. 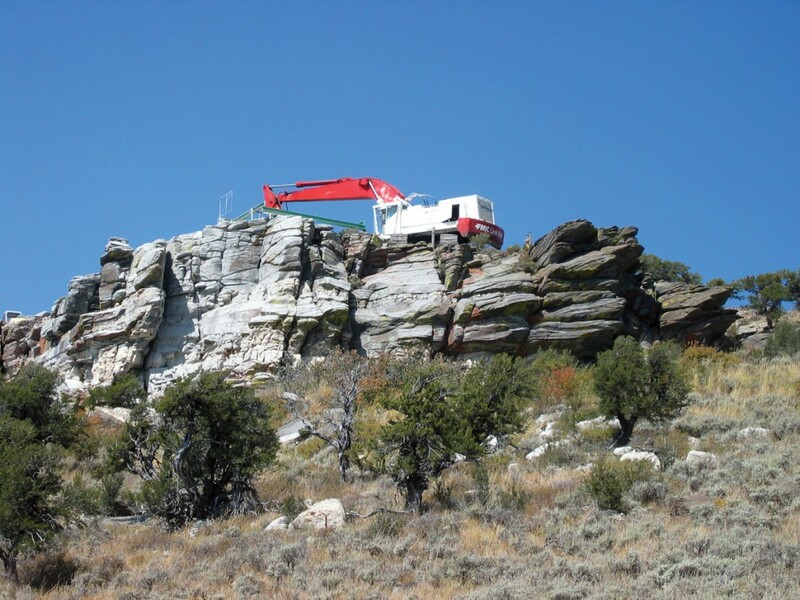 Over the past two years, the UGS, in cooperation with the USGS, has been conducting detailed aeromagnetic and gravity surveys of northwest Utah. Aeromagnetic surveys consist of mounting on an aircraft a highly sensitive instrument that detects very subtle changes in the earth’s magnetic field. These changes reveal shallowly and deeply buried iron-bearing minerals, thereby allowing us to distinguish shallowly buried basalt flows, deep-seated granitic intrusions, and thick, buried sedimentary (generally iron-poor) formations. Gravity surveys, conducted from trucks and ATVs and on foot, use a highly sensitive gravimeter to measure subtle changes in the earth’s gravity caused by rock density differences (yes, you actually do weigh a few micrograms less in some places than in others, but sorry dieters, the difference is less than when you trim your fingernails!). These subtle differences reflect density variations of underlying basin fill and bedrock, and can reveal the geometry of covered basins. When these two tools are used in conjunction with improved geologic maps and better geologic models, we can identify sites with the highest potential for geothermal resources, and prioritize targets for future exploratory drilling.